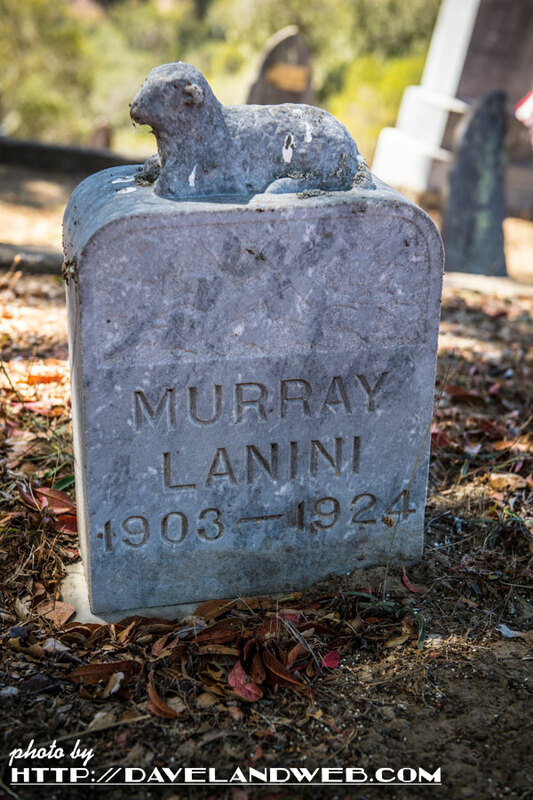 Anyone who has traveled with me knows that I typically seek out old cemeteries as I think they are a slice of history, art, and storytelling. 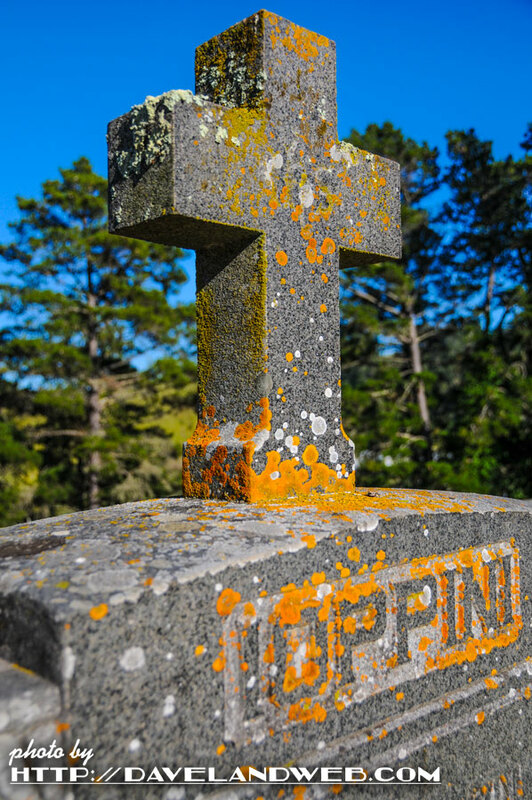 For this Halloween, I am featuring The Santa Rosa Chapel, located in Cambria, California. I stumbled upon it during my first visit there in 2010 and returned again this year. 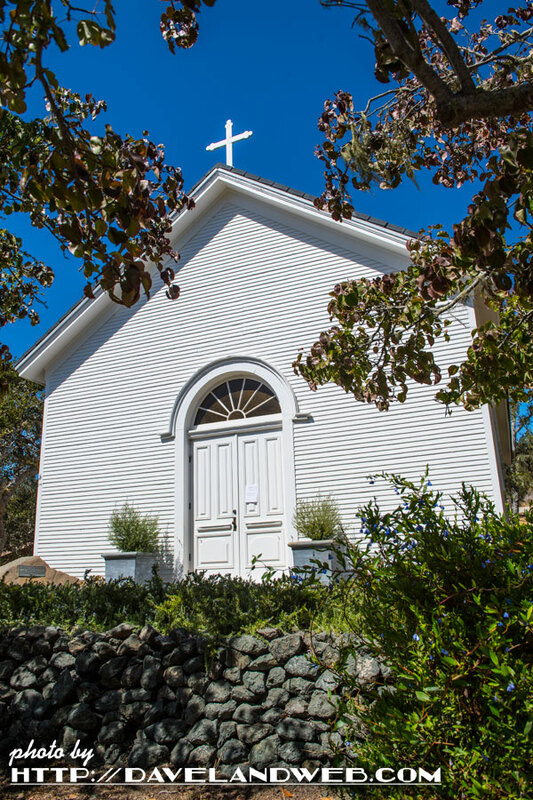 The chapel was built in 1970 for the local Roman Catholic community by Henry Williams and was the first church built in the county after its establishment in 1850. 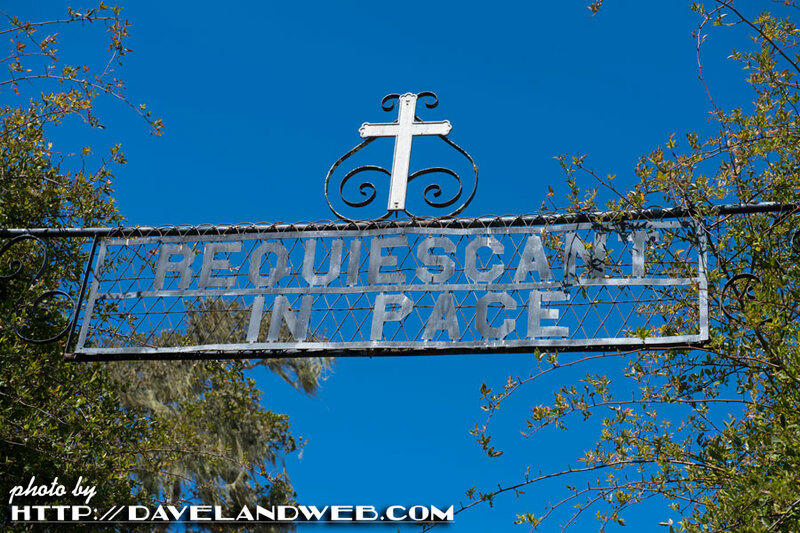 Its congregation included guests of William Randolph Hearst, Marion Davies, Gary Cooper and Bing Crosby. Why would friends of these celebrities be found here? Because William Randolph Hearst’s San Simeon property (aka Hearst Castle) was just down the road. 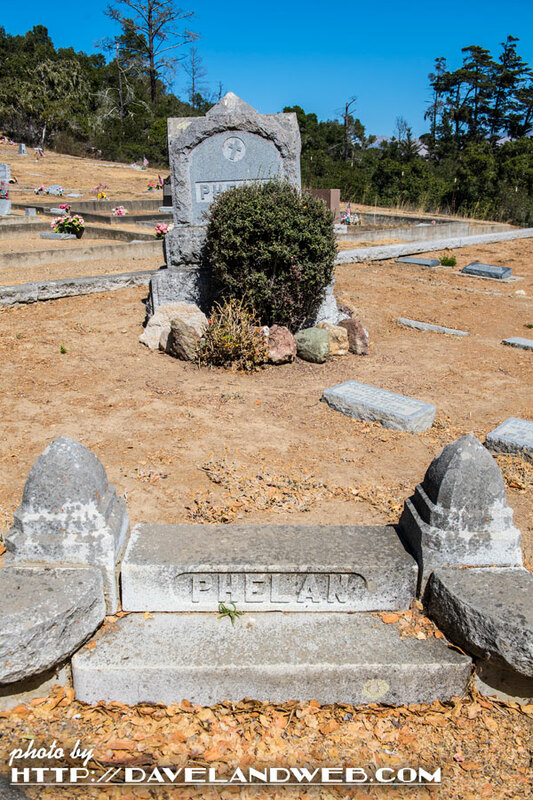 The final Mass at this cemetery was celebrated in the Chapel on May 26, 1963. 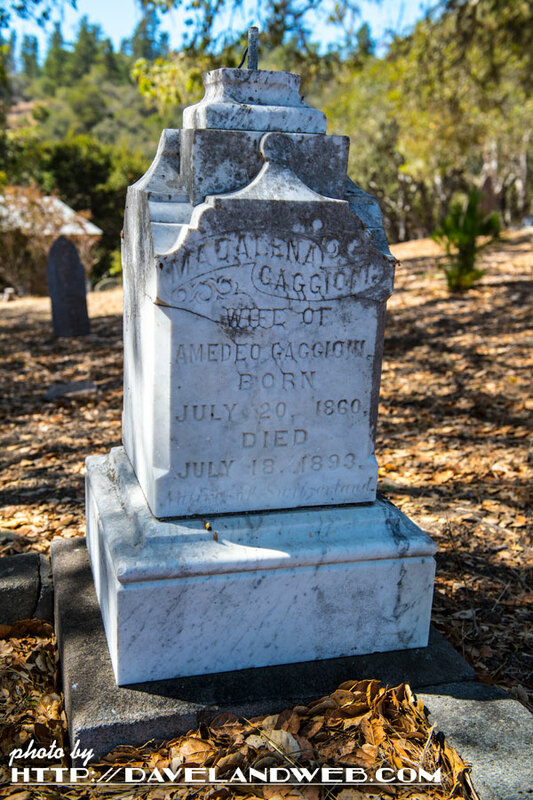 After its closing, the chapel and cemetery fell into a state of neglect and disrepair with both the chapel and cemetery incurring vandalism. 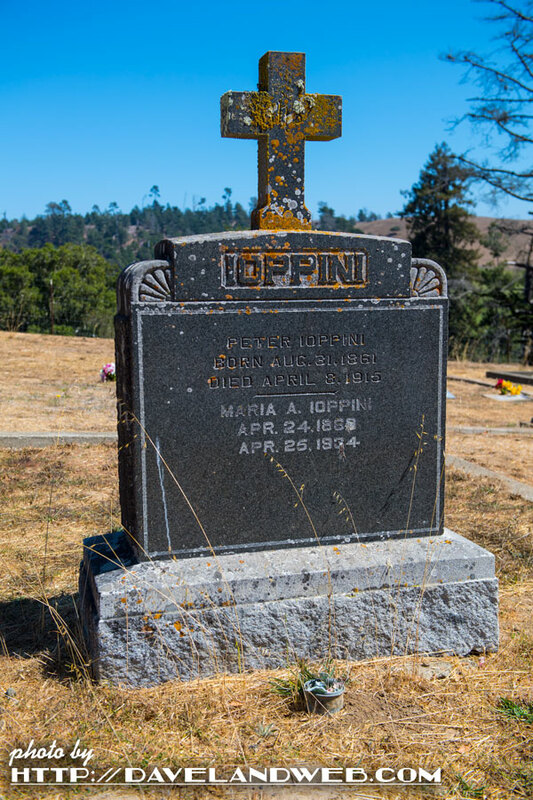 In 1978, Cambria natives Marina Curti and Clementine Newman formed the Santa Rosa Chapel committee and spearheaded the restoration project for seven years. 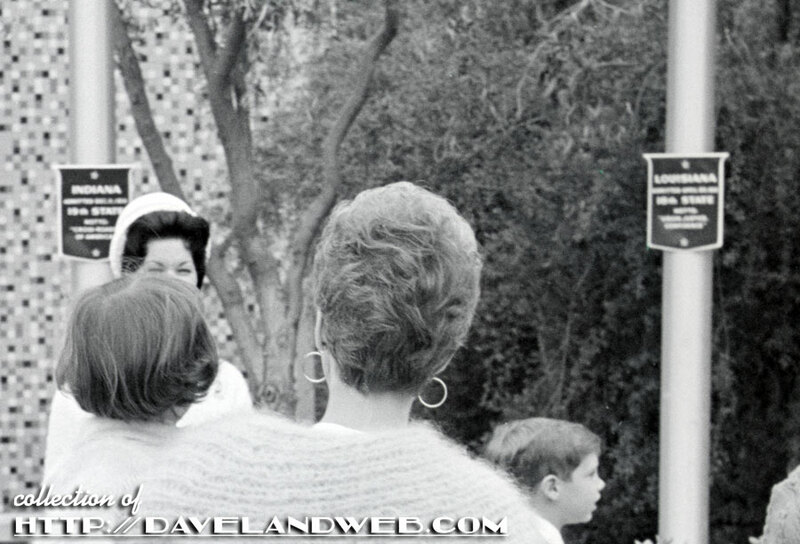 The chapel was rededicated for community use on September 16, 1984. 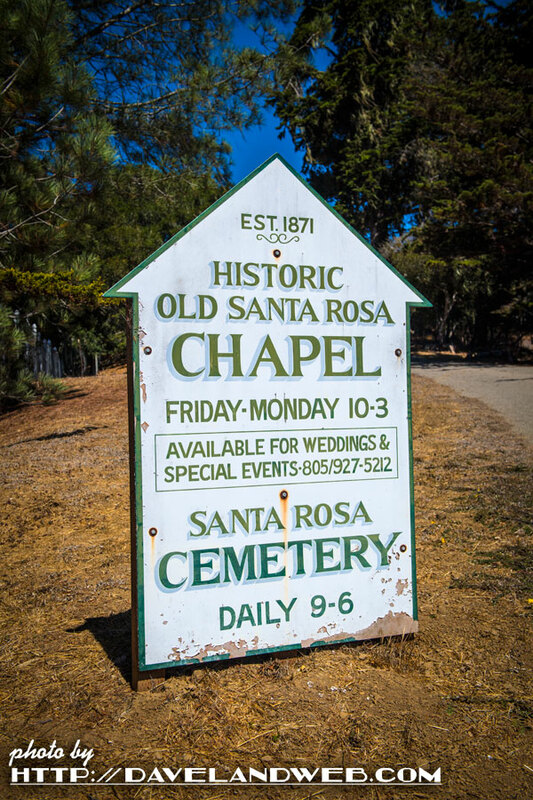 See more Old Santa Rosa Chapel photos at my main website. 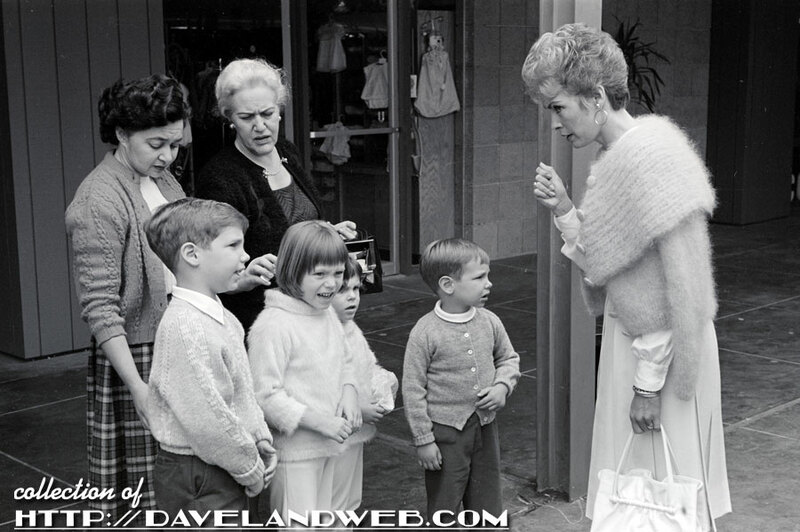 Back to 1962 when Janet Leigh was taking the kids to Disneyland. 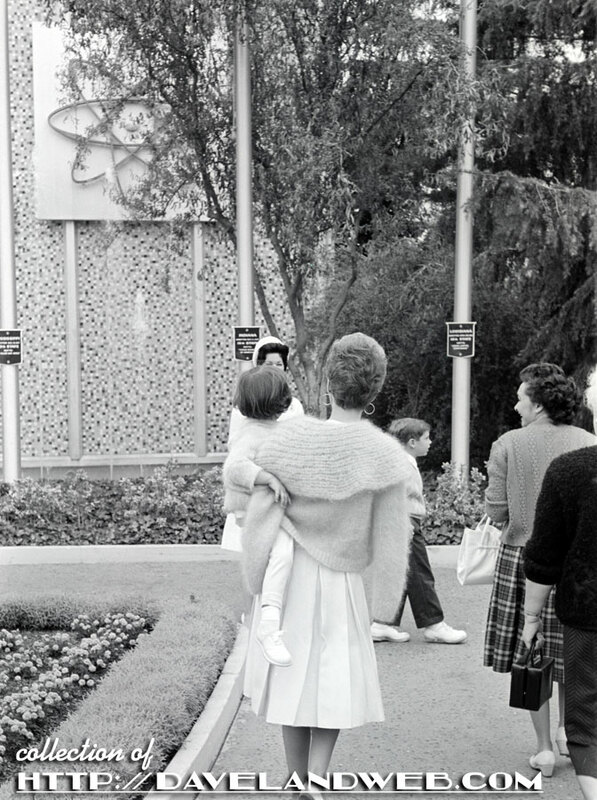 Sporting an angora wrap, I believe Janet and family are at the Disneyland Hotel in this shot. 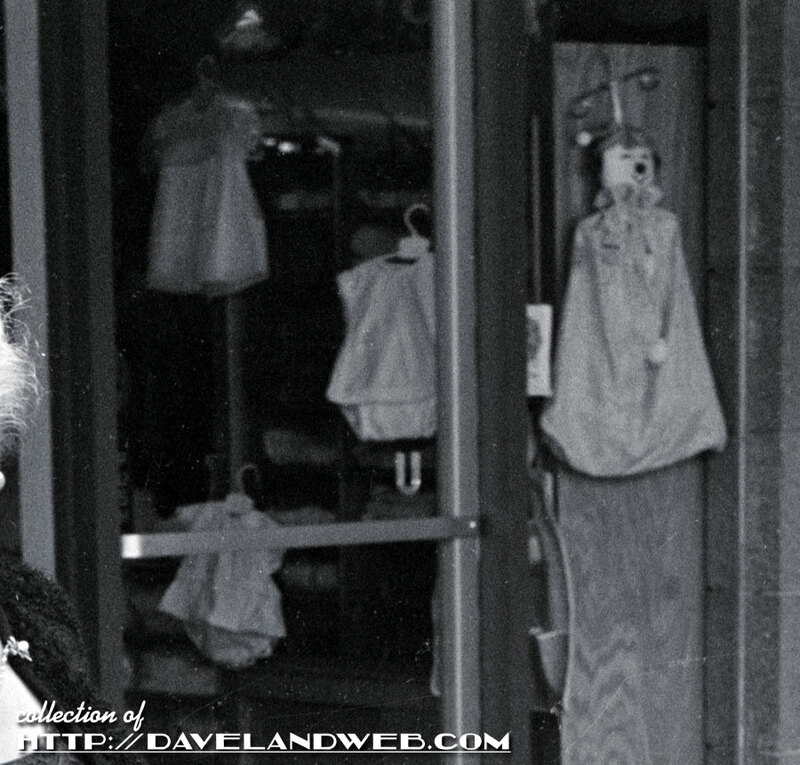 Anyone know the name of the shop they are standing in front of? 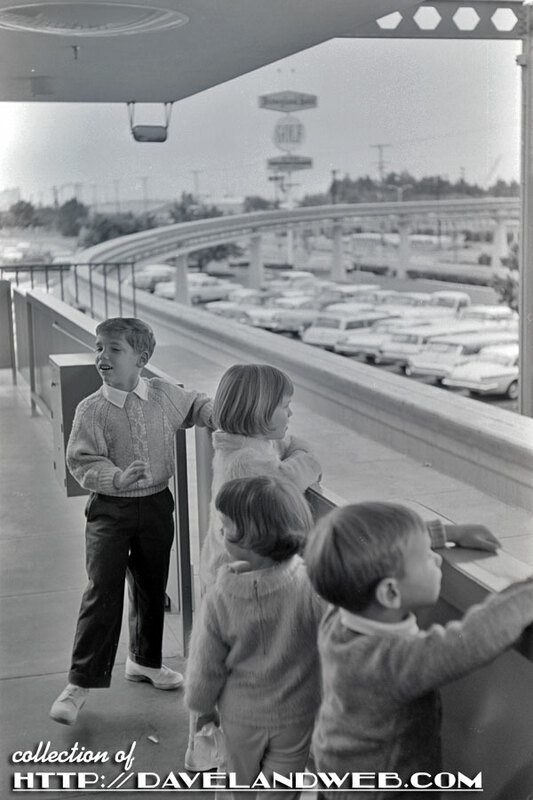 They patiently wait for the Monorail to arrive. 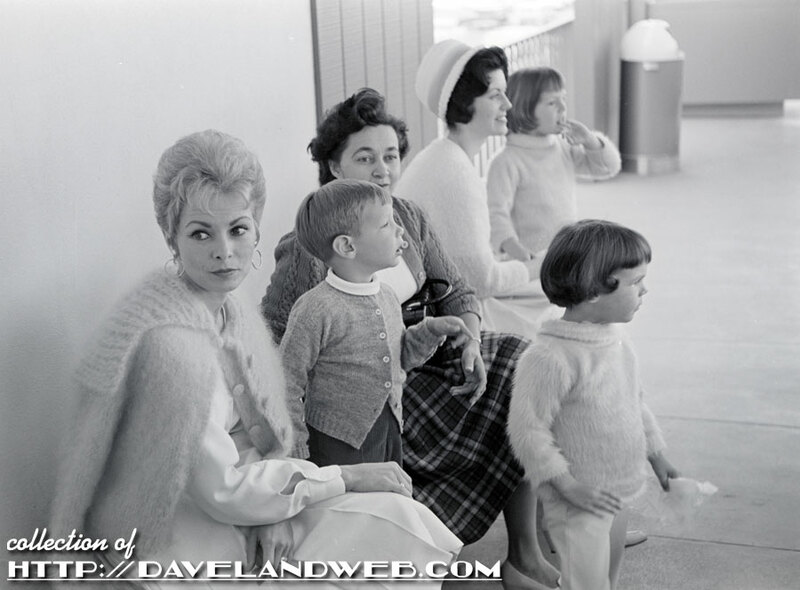 The family arrives safely in Tomorrowland, as Janet helps daughter Jamie Lee Curtis off the Monorail. Angora must have been “in” at the time. 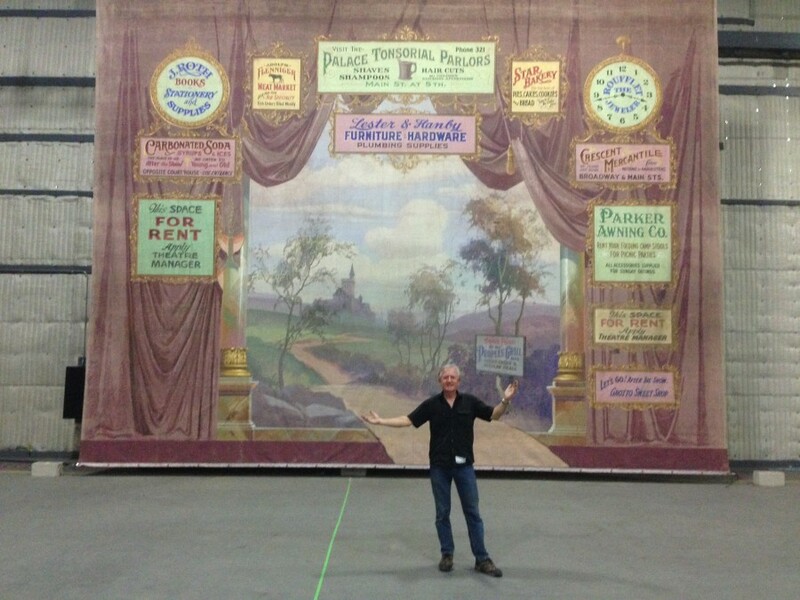 Note the two cast members at the left of the image. 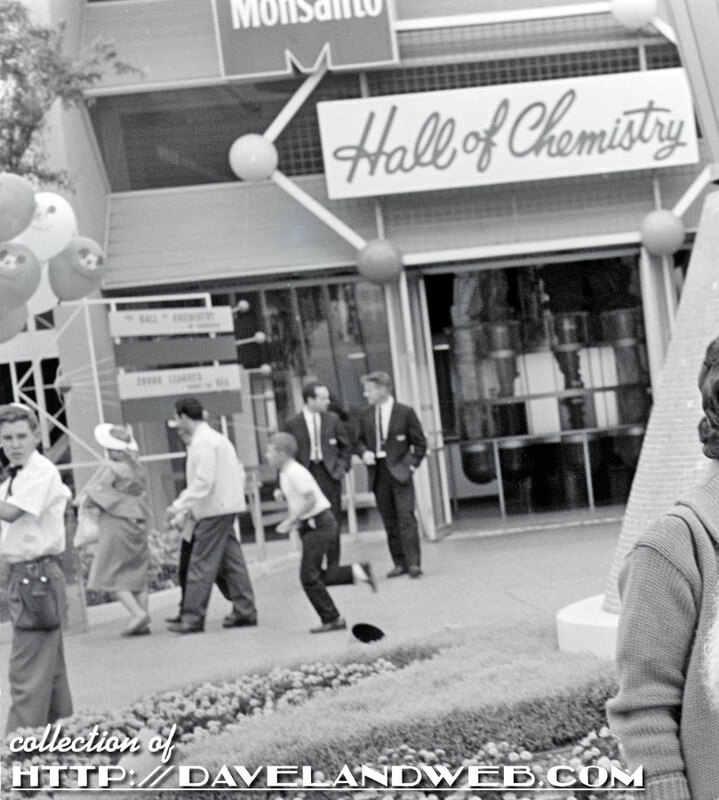 First stop in the Park is the Monsanto Hall of Chemistry. The balloon seller can’t believe he’s looking at a real movie star!! 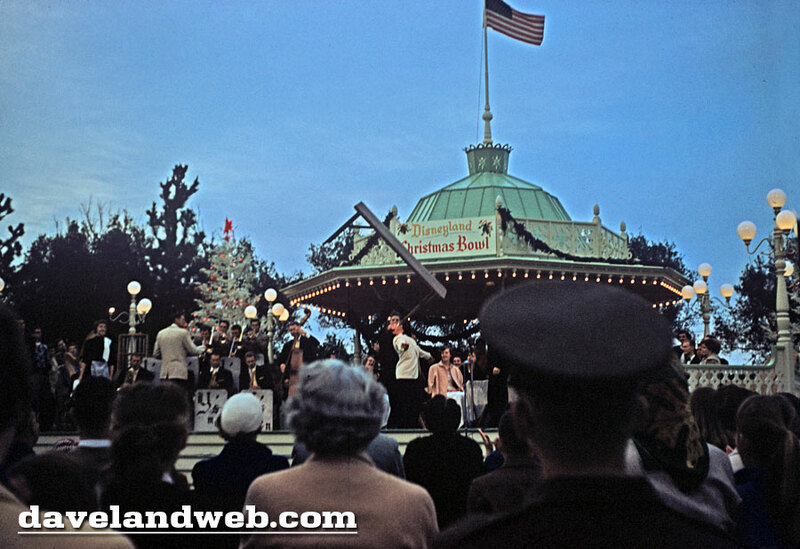 Last shot shows the family passing by the flag poles with the names of all the states. 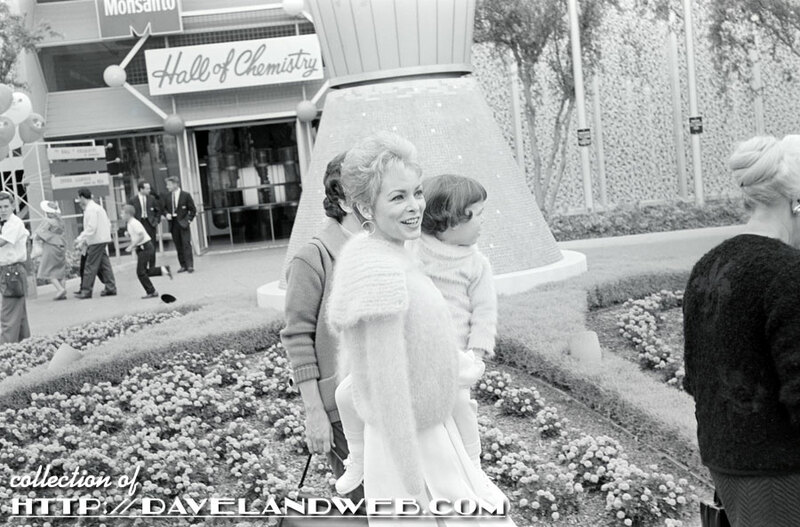 See more Janet Leigh at Disneyland photos at my main website. 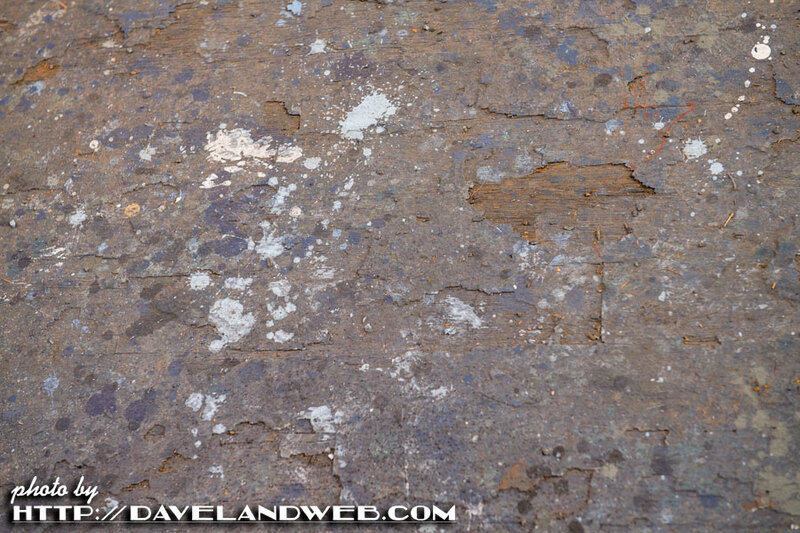 Can you imagine the history in all of these paint drops?!? 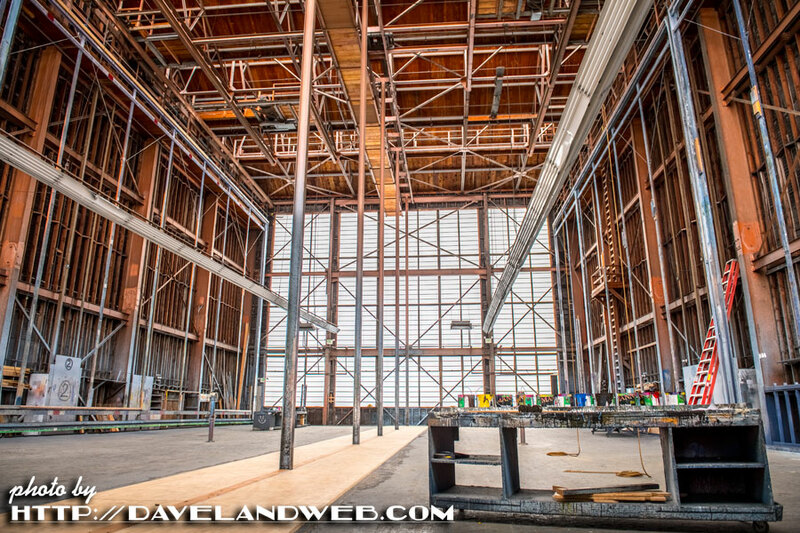 During my visit, the building was vacant awaiting its next purpose. I probably don't want to know what’s going to happen to it next. 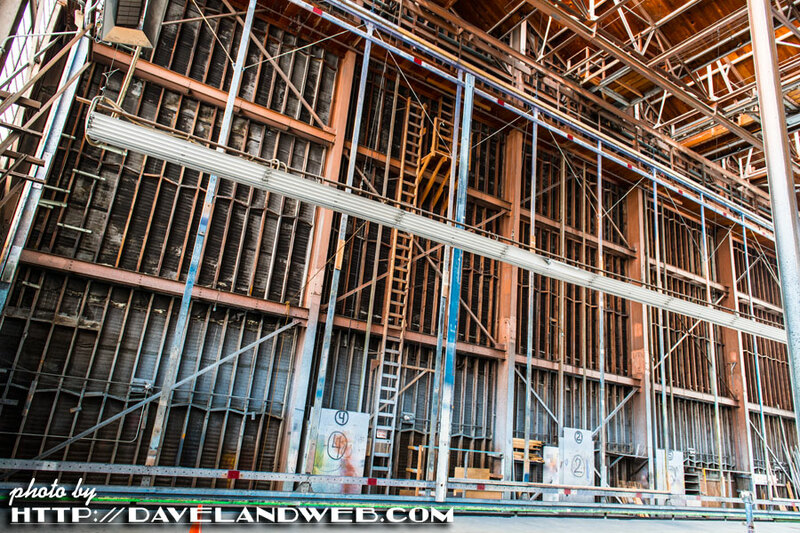 See more MGM/Sony Studios photos at my main website. 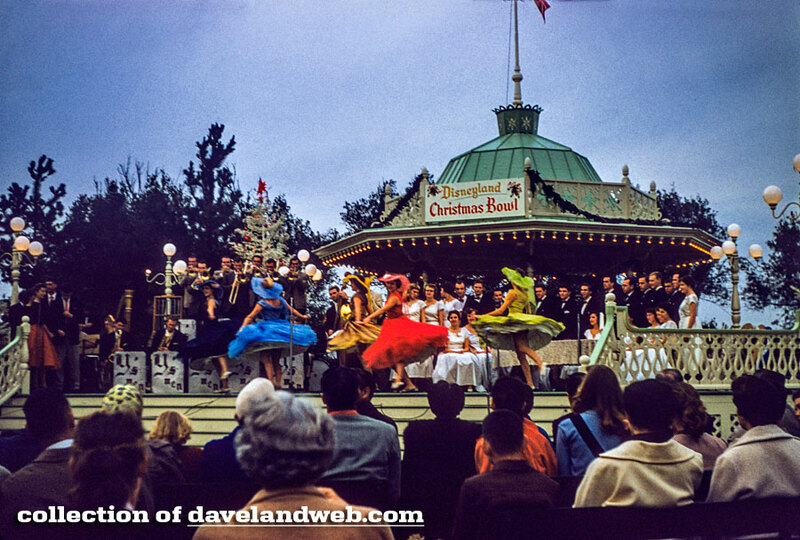 You know you have too many vintage Disneyland images when...it takes you eight years to publish an image that you scanned at that time! 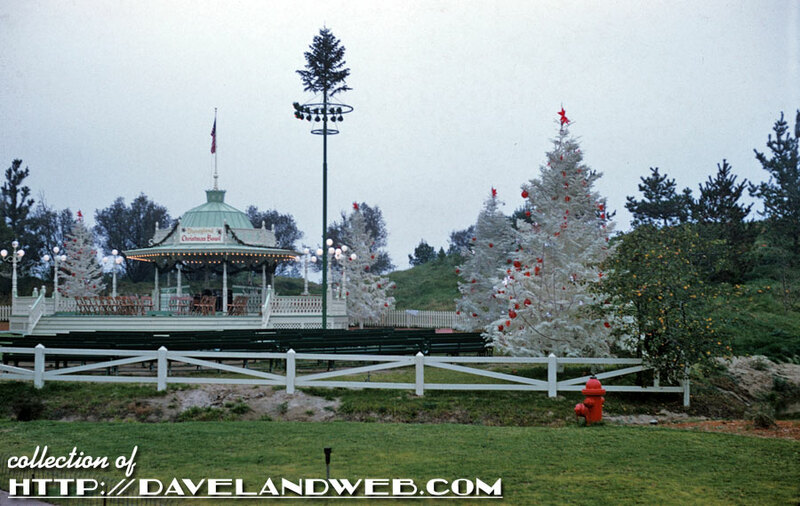 I couldn’t believe it when I found this shot of an empty Magnolia Park Bandstand ready for the next Christmas Bowl program from December 1956. 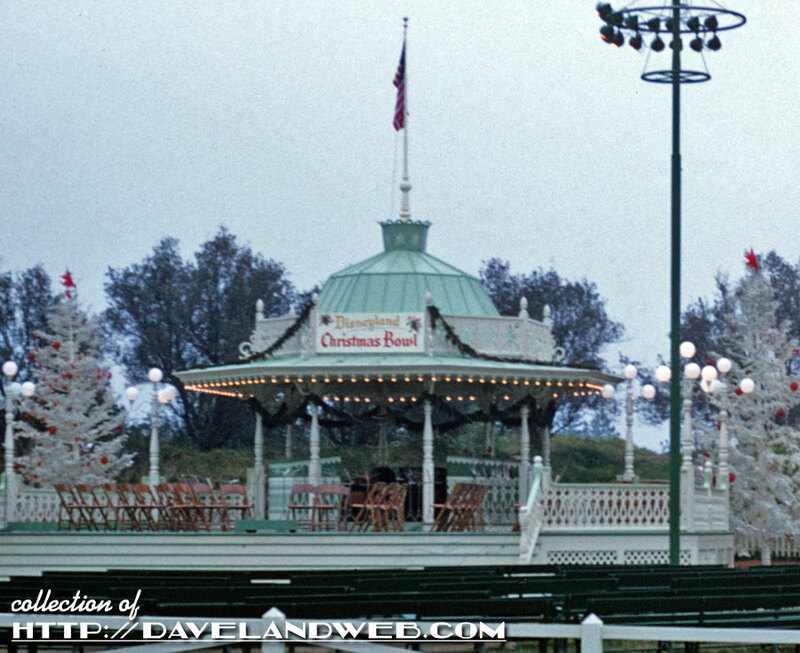 See more Disneyland Magnolia Park photos at my main website. 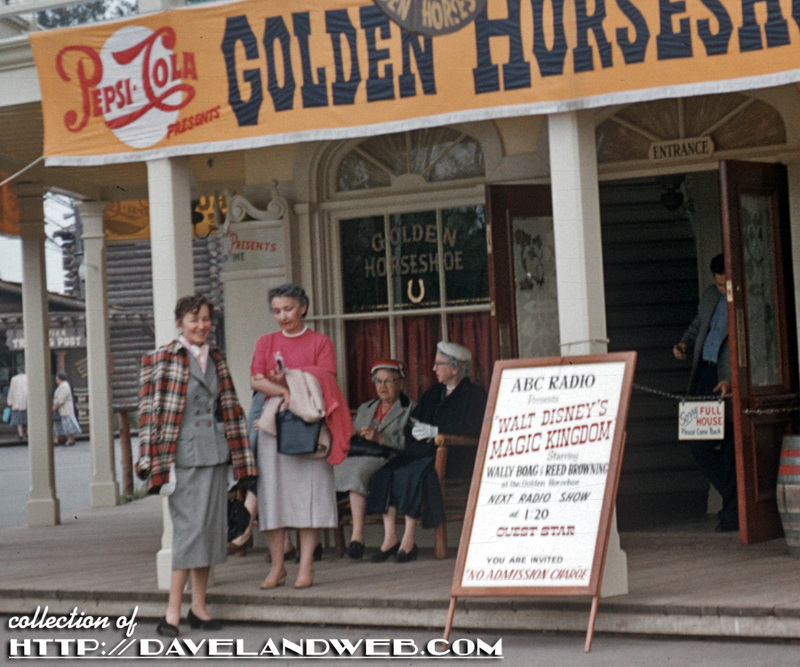 These two fashionable 1956 ladies are posing in front of the Golden Horseshoe Saloon at Disneyland’s Frontierland. Looks like there’s an ABC Radio Show being broadcast here. Anyone know who Reed Browning is? 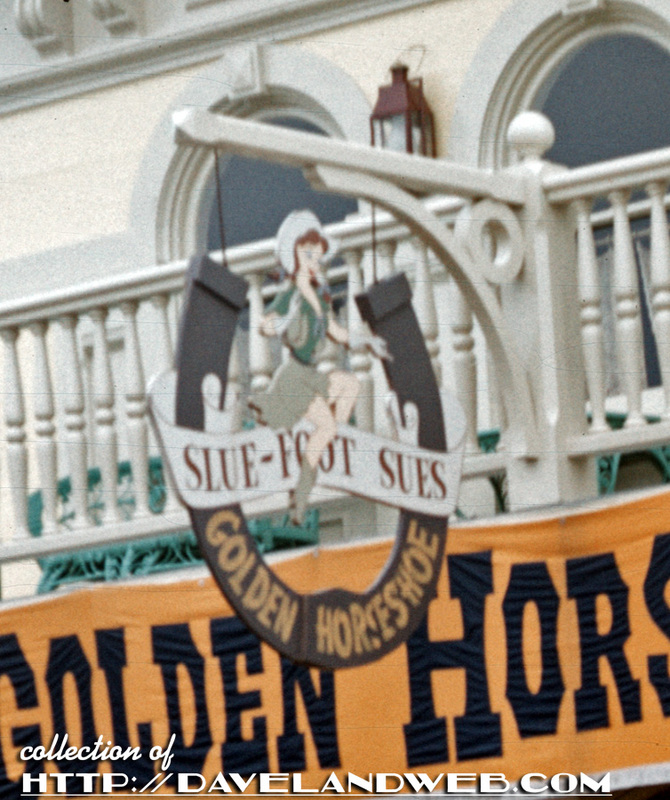 Had to zoom into the Slue Foot Sue sign. 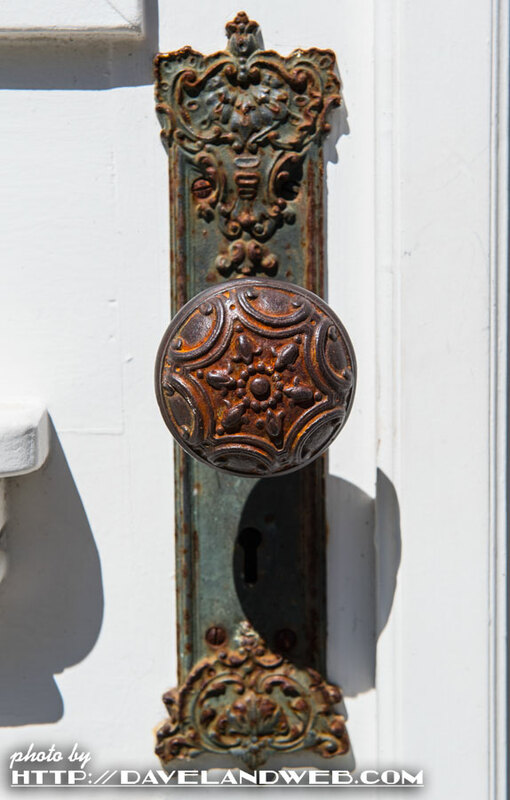 Sure do love that piece of vintage design! 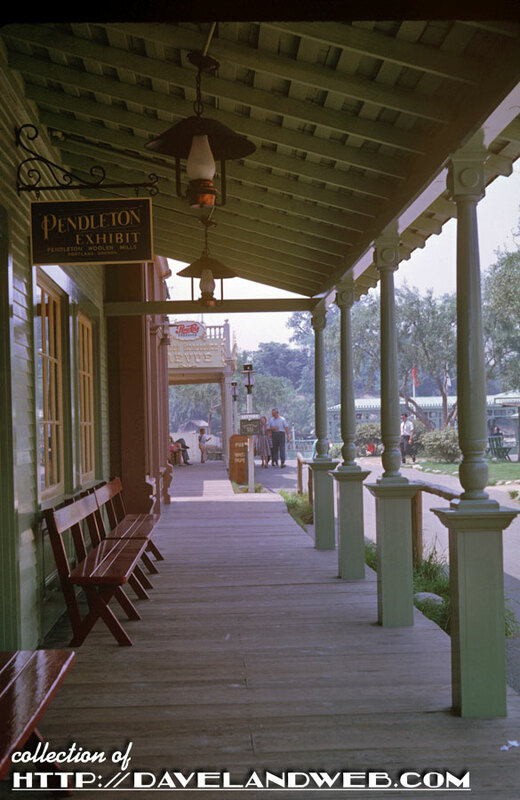 This previously unpublished April 1962 image shows the walkway around the corner from the Saloon in front of the Pendleton Shop. Perhaps the plaid coat the fashionable lady is wearing came from here? 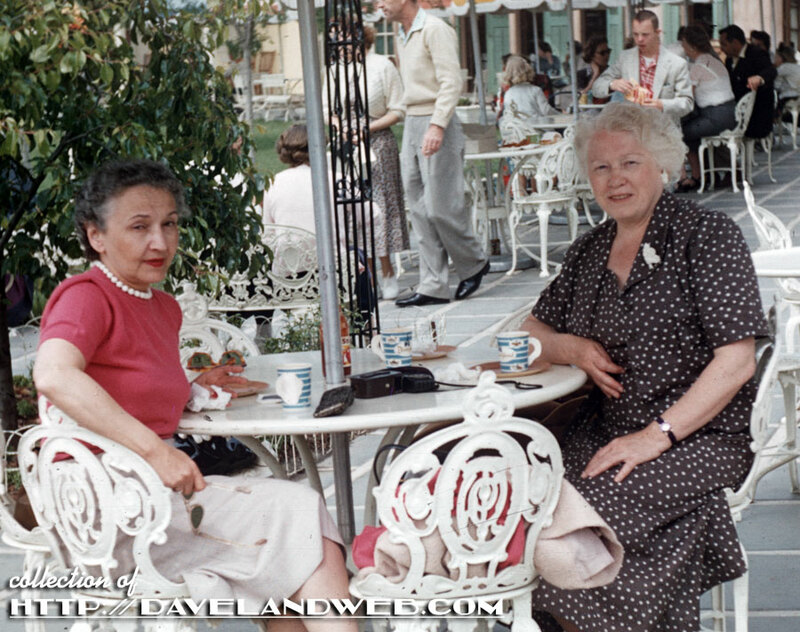 Back to 1956, these ladies are enjoying a little refreshment outside the Aunt Jemima’s Kitchen restaurant on New Orleans Street. All I see are vintage cups; no pancakes. Darn! 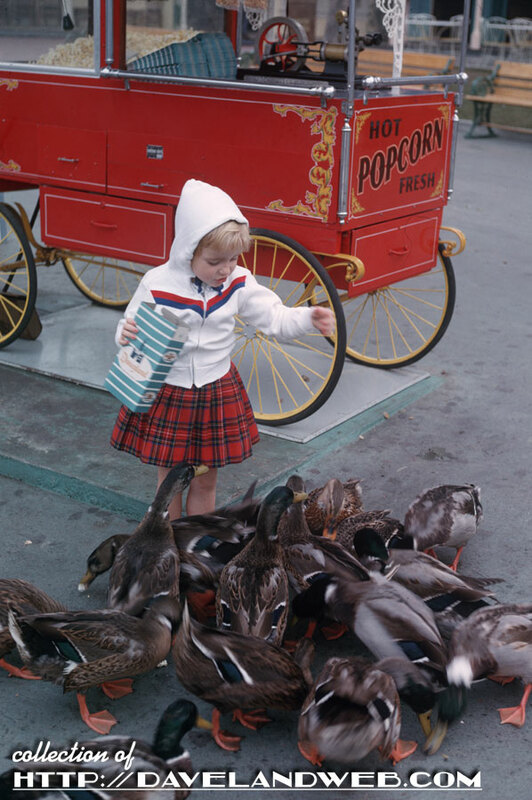 Last one for today shows a girl feeding the ducks with popcorn from a Frontierland Popcorn Cart, circa April 1962. 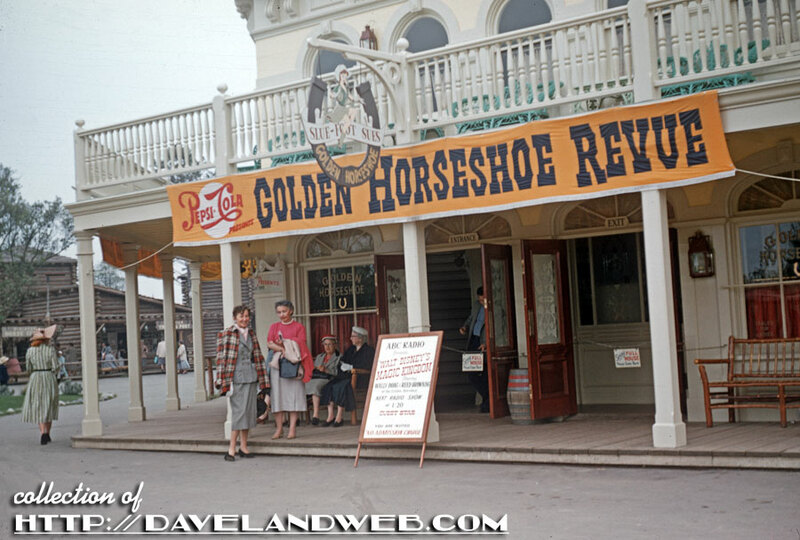 See more Disneyland Frontierland photos at my main website. 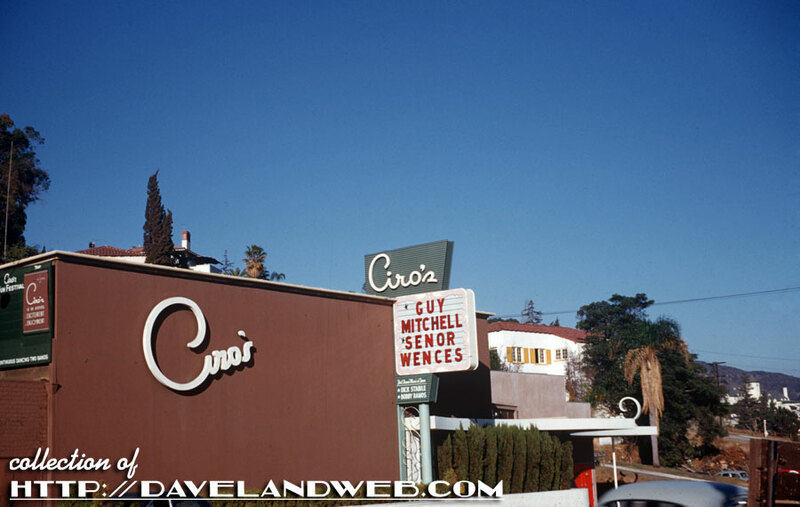 A shot of Ciro’s Nightclub on Sunset Boulevard circa November 1954. One of those most popular nightclubs back in the day for stars who wanted to appear in the gossip columns of Hedda and Louella. 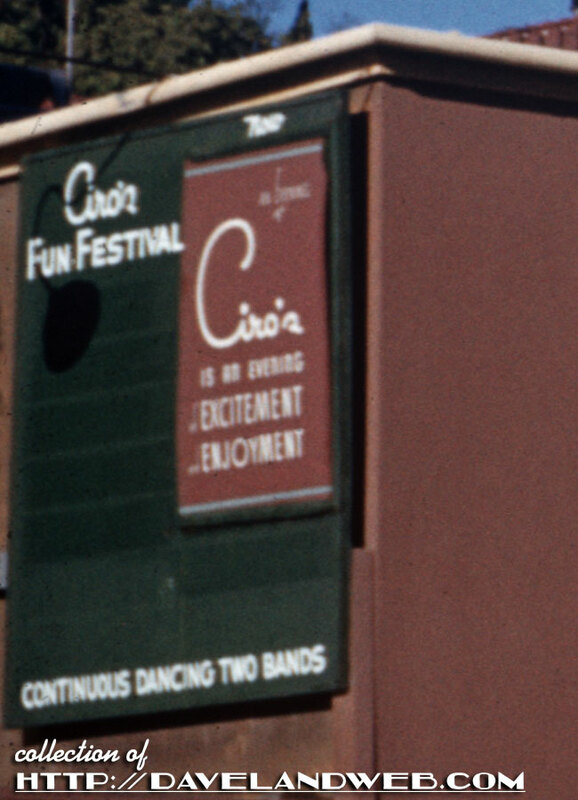 Excitement and Enjoyment? Count me in! 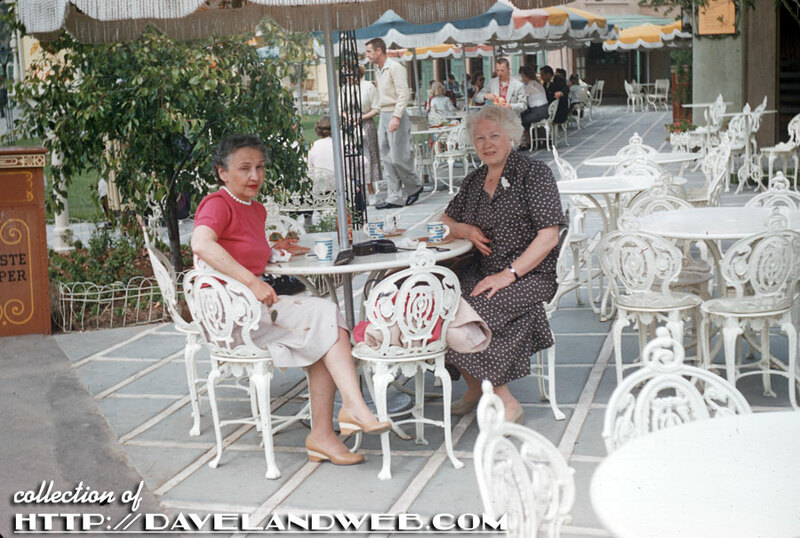 You can make out my favorite hotel in the corner, The Chateau Marmont. 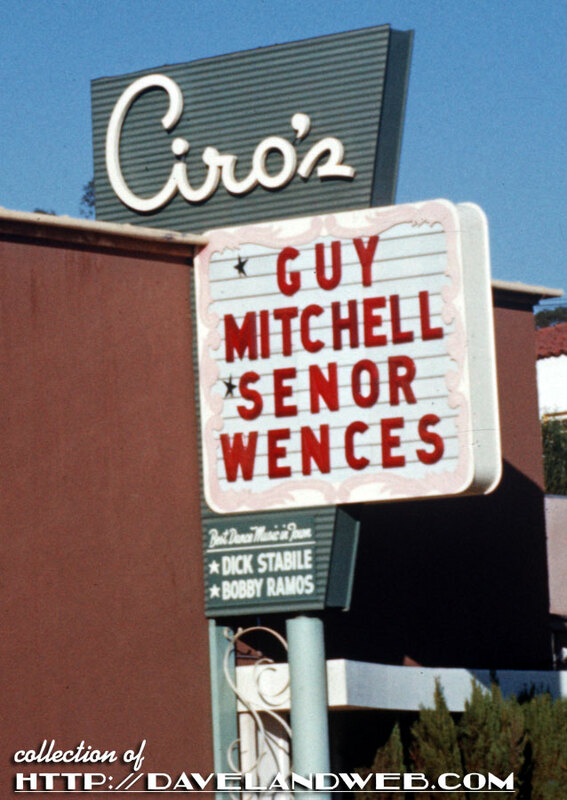 The Marquee shows that pop singer Guy Mitchell and Spanish ventriloquist Señor Wences are the headliners. Señor Wences found fame with his frequent appearances on the Ed Sullivan Show. 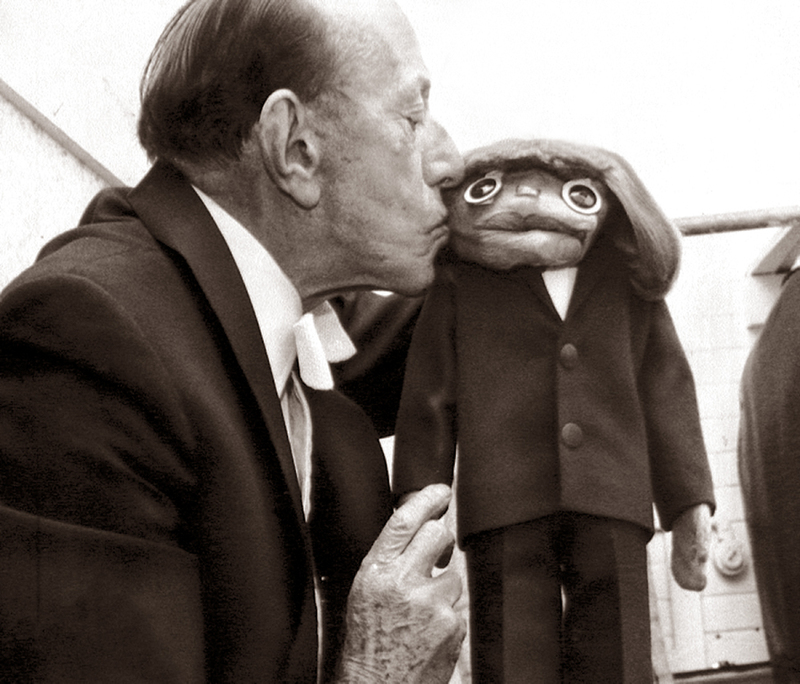 A puppet from your own hand? Brilliant! 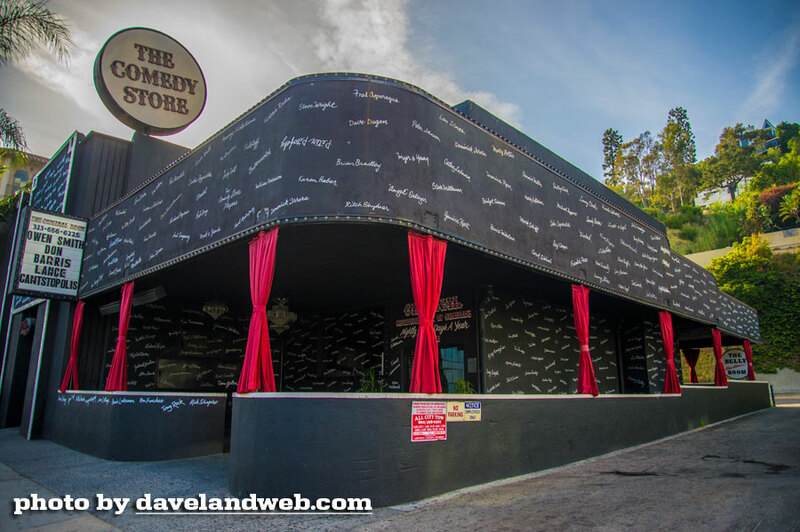 According to the LA Curbed website, the place is now haunted by several hit men, as well as a woman who performed illegal abortions in the downstairs lounge and a woman who died getting one of those abortions. 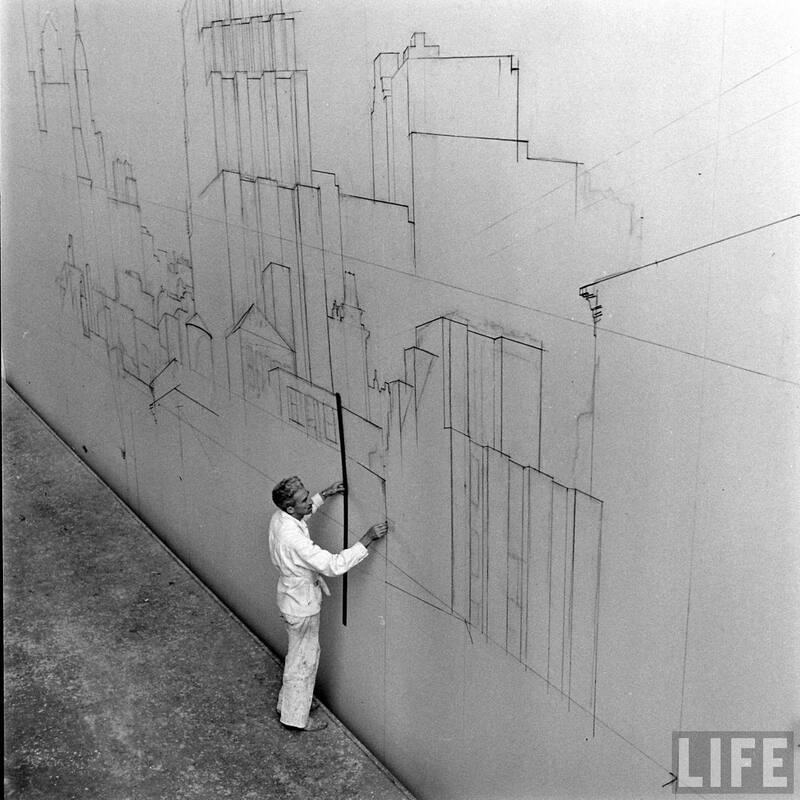 See more Sunset Boulevard photos at my main website. 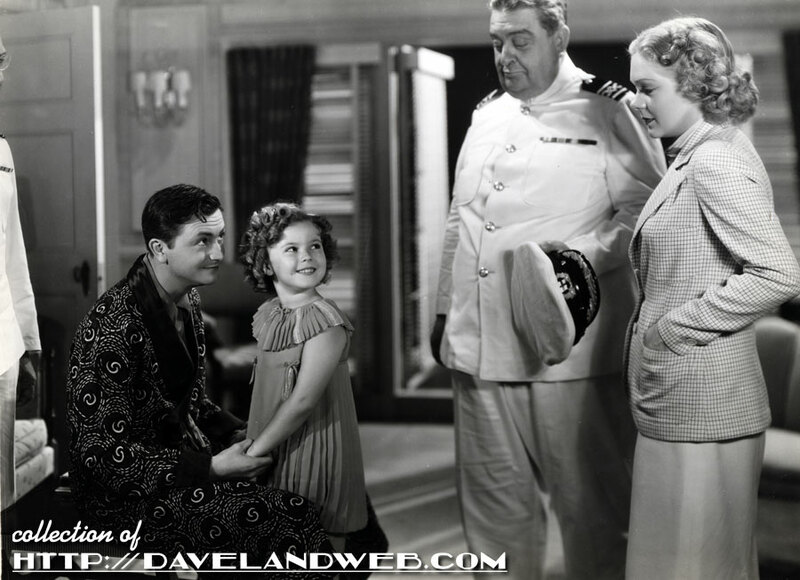 In the 1936 Shirley Temple classic “Stowaway,” the curly-haired moppet is ably supported by Robert Young and Alice Faye. Naturally she’s an orphan who plays matchmaker for her two costars. 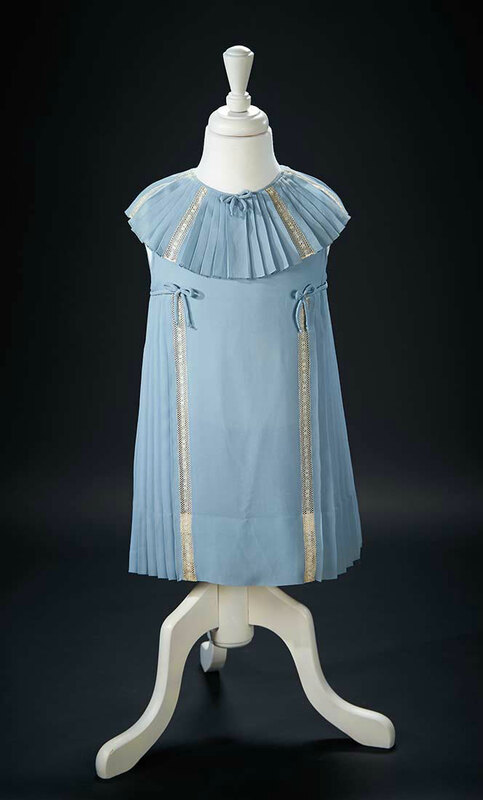 The costume shown here, designed by Royer, was worn by Ching-Ching (Shirley Temple) in the scene with Susan Parker (Alice Faye) when she changes from her Chinese costume to this dress, bought in the dress shop of the steam ship. 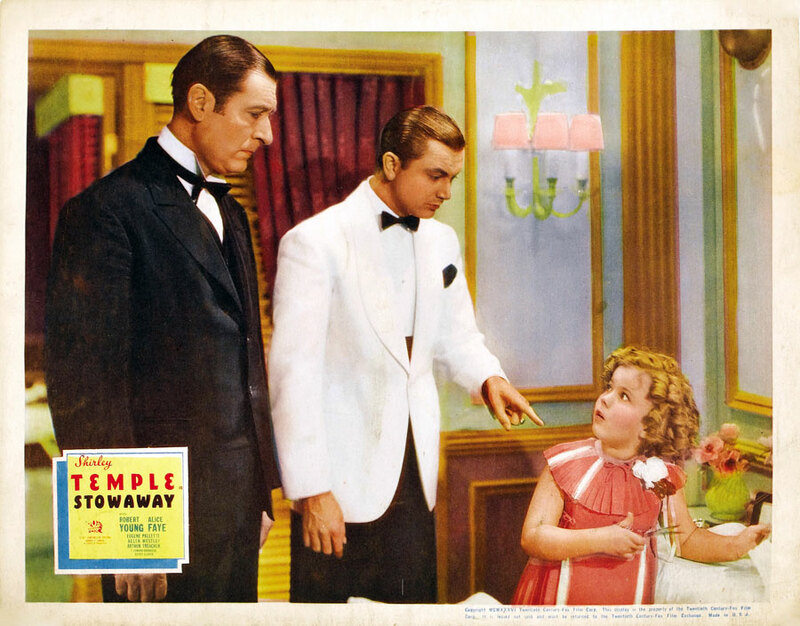 Shirley exclaims, "I've never had a dress as nice as this" while twirling around, and then meets up with “Uncle” Tommy (Robert Young) where she exclaims, "I'm a stowaway, but I didn't mean to be." 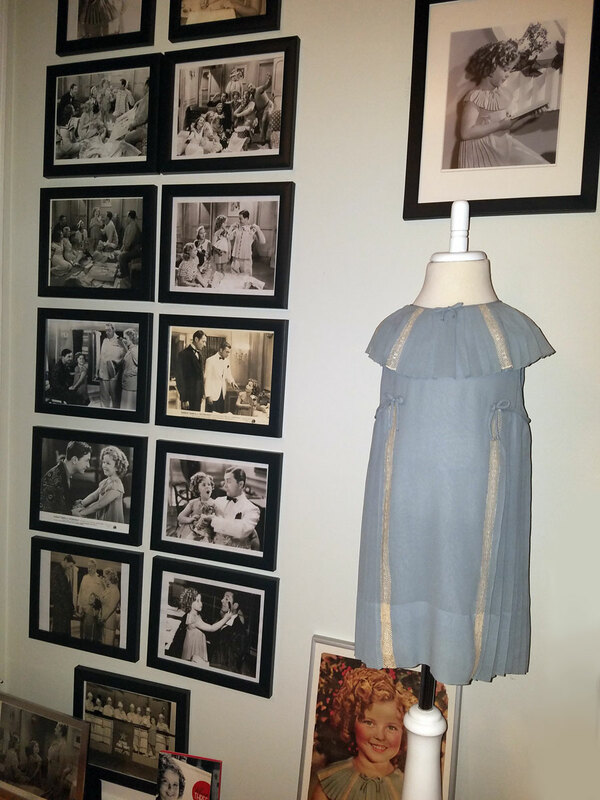 This dress was also worn in a deleted scene and musical number that followed. 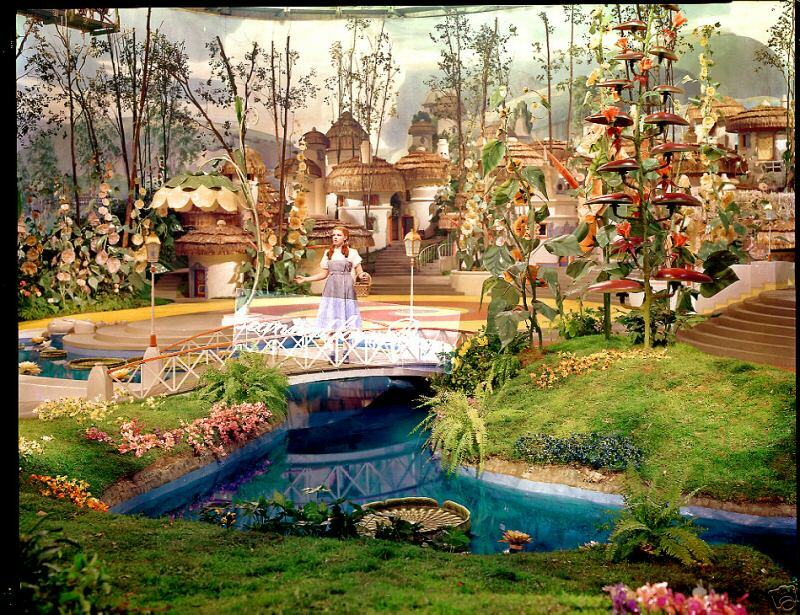 There are many existing stills from this deleted scene which can be pieced together thanks to a vintage storybook tie-in published by Saalfield. 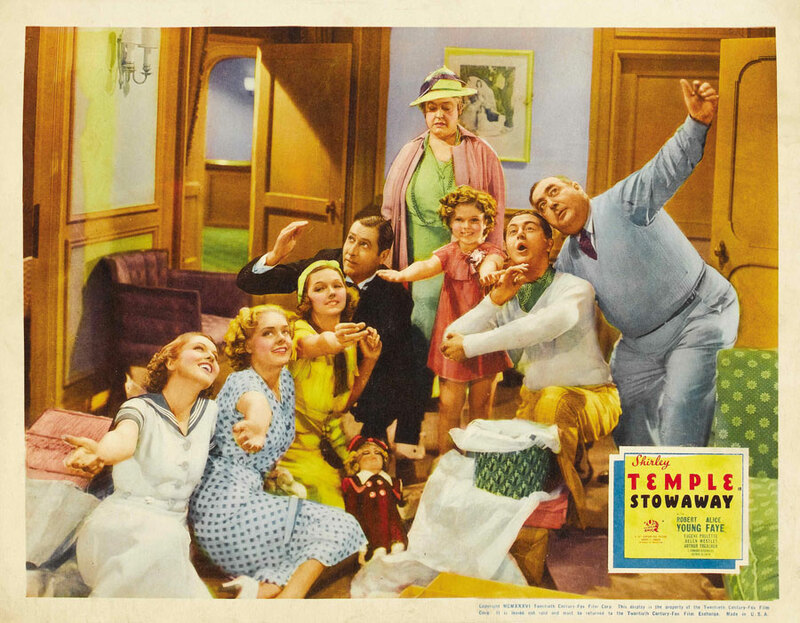 In this vintage lobby card, it looks like Helen Westley’s character, Mrs. Hope, was breaking up this party! 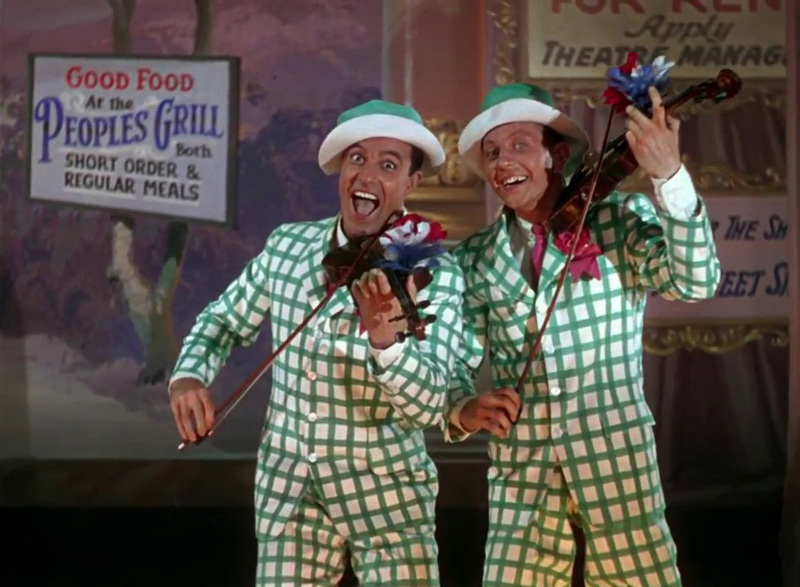 The gang appears to be singing a song in this shot; it could be “All Aboard the Dreamland Choo Choo” or “I Wanna Go to the Zoo”, as both were mentioned in newspaper articles at the time as songs from “Stowaway,” and there was “Zoo” sheet music. 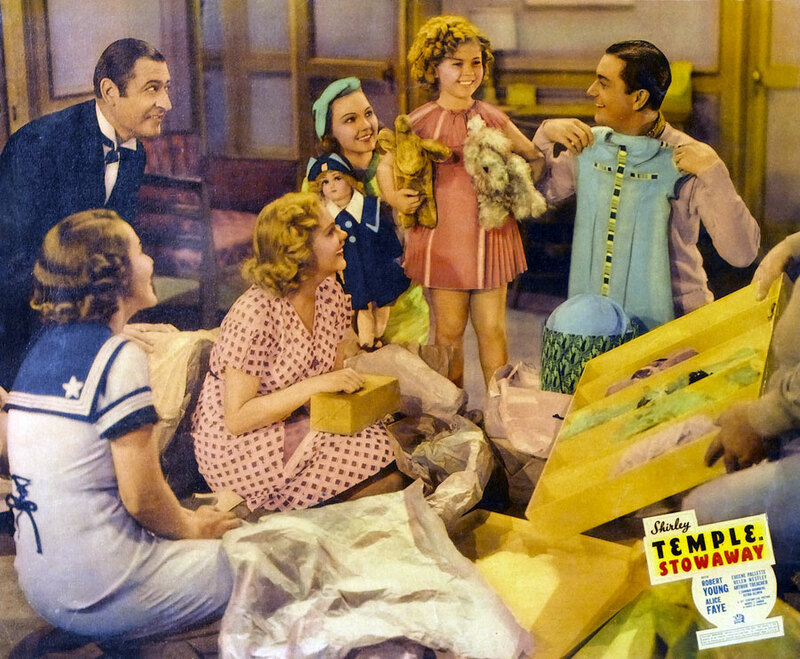 No sheet music for “Choo Choo,” but there is a recording – but that may have been done later, as “Choo Choo” was also slated for – and deleted from – “Rebecca of Sunnybrook Farm.” Most likely it was “Zoo” that they sang here; later, Ching Ching and Tommy would sing a snippet of it as they returned to the ship. 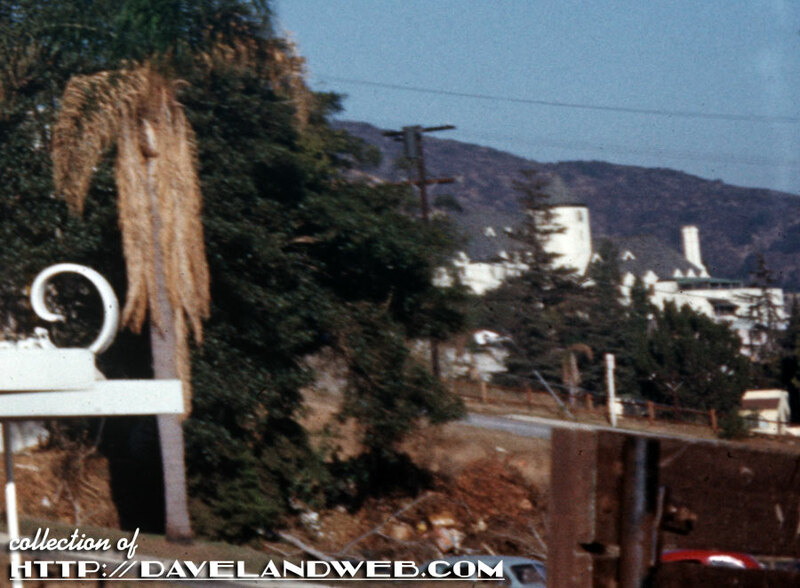 This photo from the deleted scene shows Ching Ching with a pair of scissors. 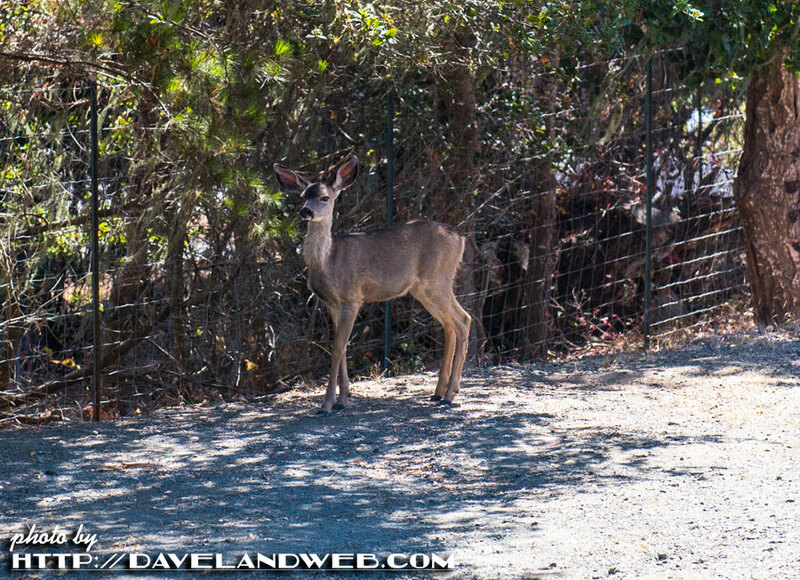 Most likely it came after the party, as she’s wearing her corsage. 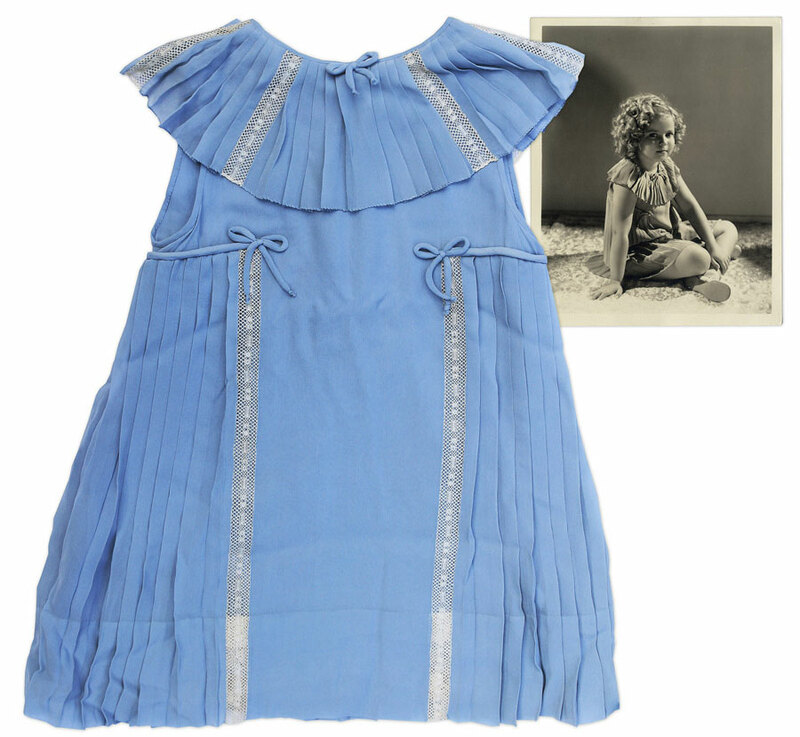 Almost 80 years later, this dress came up for sale at the Shirley Temple estate auction held by Theriault’s in July 2015. First thing you’ll notice is that the person who tinted the vintage lobby cards wasn’t concerned with accuracy, as the original dress is blue, not red. 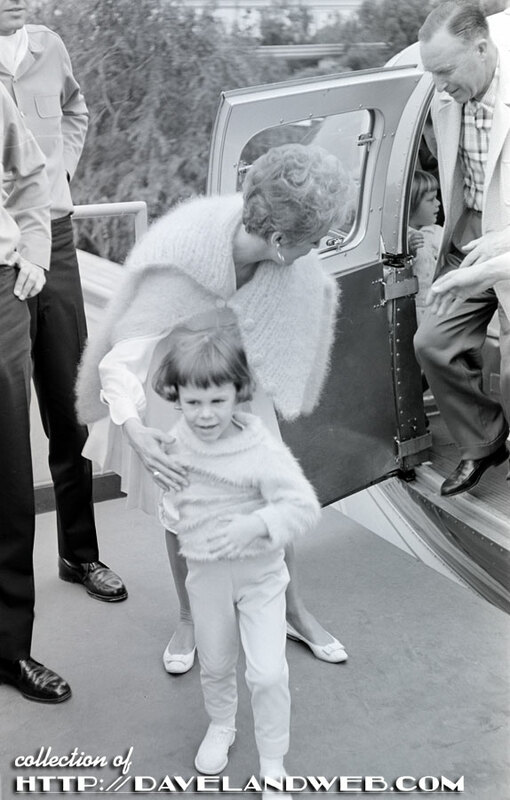 Lifelong Shirley Temple aficionado Melissa, aka “The Colonel,” was at the July 2015 auction. “I didn't even dream of owning a costume, let alone from one of my very favorite Shirley films,” she told me recently. 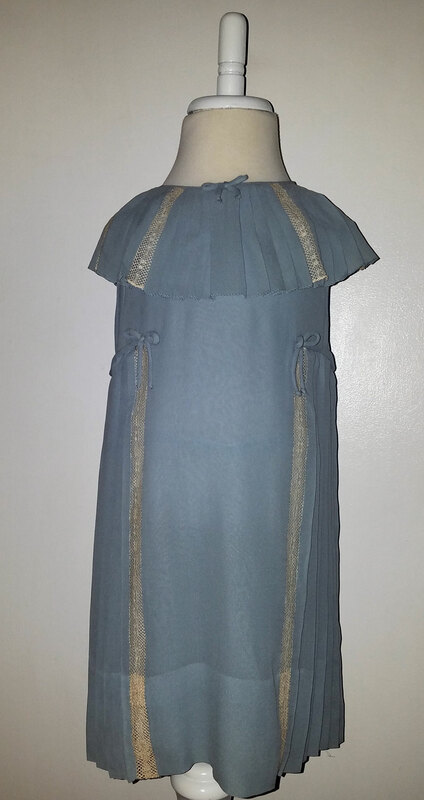 The dress came up for bid and was gone, along with a number of other Temple screen-worn costumes. Who bought them? The Nate Sanders Auction House. 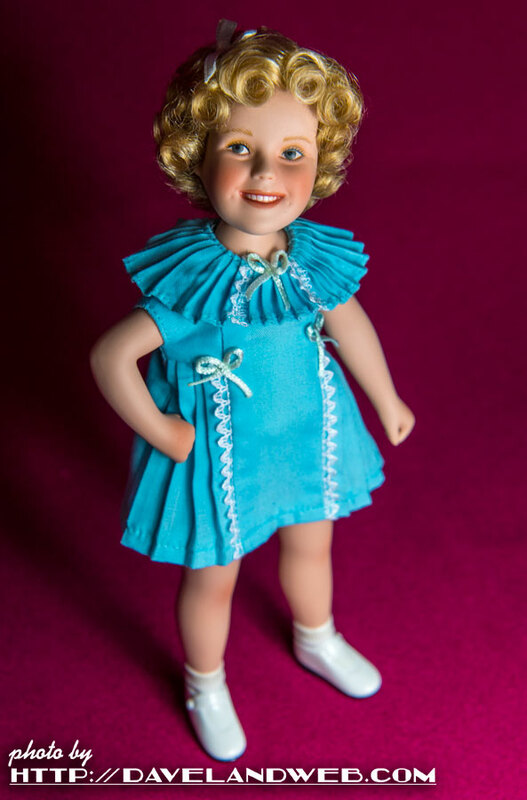 On a side note, The Danbury Mint released this 8" miniature Shirley doll wearing the “Stowaway” dress. 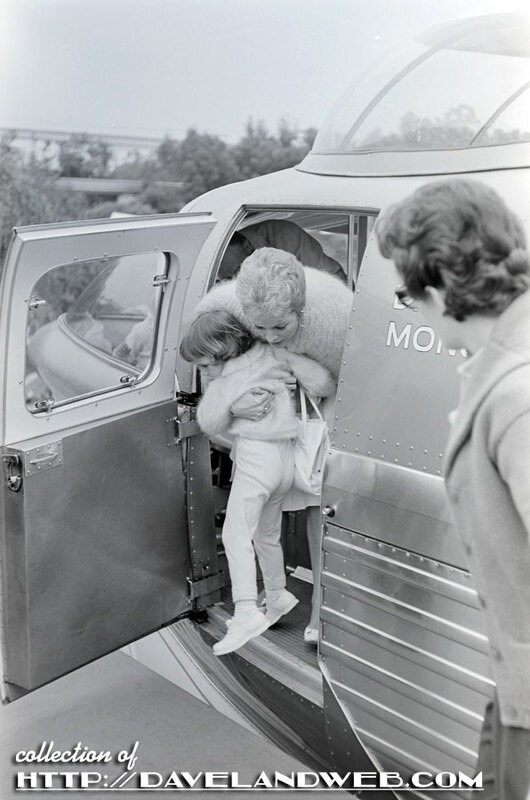 The fact that Shirley Temple Black herself chose this outfit for the doll tells me it was a very special one to her...and they even got the color right!